Incorporating Periscope, a live-streaming app, into classroom instruction to allow students to experiment with the notion of going live from their palm. In the past two years, live streaming from mobile devices has moved from an introduction at South By Southwest to the palms of our hands via apps such as Periscope, Meerkat, and Facebook Live. When House Speaker Paul Ryan ordered the C-SPAN cameras turned off during the Democrats’ sit-in over the gun violence debate in June 2016, Democrats launched Periscope to stream their message to the masses. As a journalism instructor, I constantly strive to stay current with the latest technological advances as the digital disruption to all industries continues to grow. Once the live-streaming apps began emerging in the spring of 2015, I began to embed them in my instruction as a way to allow students to experiment with the notion of going live from their palm. I chose to use Periscope because of its ease of interactivity with Twitter and because my students are required to have Twitter accounts for their journalism course work. Additionally, Periscope works well with an iPad or iPhone when it’s connected to wi-fi or a strong data plan. Although the title of my intermediate-level journalism class is Reporting for Print Media, I stress the need for digital, social, and mobile media skills for reporting. To that end, when Periscope emerged in spring 2015, I began building a unit in which students examined examples of Periscope videostreams and completed readings about how news organizations have used Periscope to report live from smartphones or other mobile devices. My intention was to help students understand that live-streaming apps can be used for live reporting on news events such as police pursuits, speeches, or other news stories that allow for an immediate broadcast. Also, I wanted the students in the Reporting for Print Media class to understand that competition with broadcast or online outlets could be leveled with live-streaming apps that allow anyone with a smartphone or mobile device to go live immediately from a news event. One of those Periscopes came from Fox 13 in Memphis, Tennessee during a police pursuit in April 2015. Figure 1: Tweet from Matt Gerien’s account that indicated he was on the scene of a shooting. We watched the broadcast and then considered the following questions that tied the technology back to journalism. What value does this Periscope have to the viewers? To the journalist? What are some of the legal and ethical concerns about showing a police chase live? What are some of the legal and ethical concerns about the viewers’ comments or questions? Would you as a journalist respond to these questions? Why or why not? What type of response would you give? I then asked the students to read and reflect on articles from The Verge and Slate before the next class session and our Periscope assignment. Both articles discussed the aftermath of an explosion in Manhattan and the role live-streaming apps such as Periscope played in both the professional and citizen journalism coverage. In the Verge article, author Ben Popper said this technology has allowed for “uncharted new forms of media creation and consumption to emerge.” Although he learned of the explosion through Periscope, he said he felt as if he had less information than had he consumed traditional media such as a broadcast or a news article. On the other hand, the Slate article by Jacob Brogan indicated that the author felt as if he had more information from various sources, but yet he still wasn’t sure what happened. He suggested that once broadcasters learn how to use the technology, that may change. To drive our discussion during the next class session, I supplied questions. 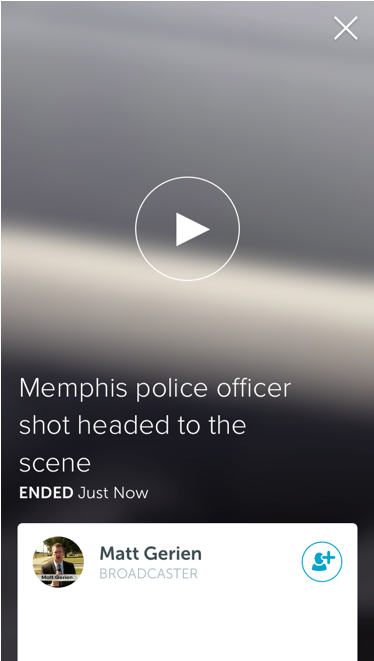 Once we established a conversation about how Periscope can be used to cover news events, we tested the app by covering a live speech by Jim Burress, a public radio reporter in Atlanta and a Murray State graduate. I gave my students the journalism department’s iPads and asked them to make Periscope accounts and conduct a few test shots before the speaker began. I also provided them with brief instructions on using Periscope. Before the assignment began, I distributed a rubric (Figures 2 and 3) to help guide their work. In particular, they needed to know how to steady themselves or use a small tripod included in the mobile media kit to ensure quality video. I also asked them not to move around during the filming and to stand (or sit) close enough to collect good audio for the Periscope. Typically, audio on mobile devices tends to be muffled unless the camera-operator either uses external microphones, which we don’t have, or sits close to the speaker. After the speaker finished, I asked students to download their Periscope and return to the news lab to write a WordPress.com blog post that discussed both what the guest speaker said and their experiences with the new technology. In this blog post, I asked them to consider several questions, and they had to upload their video to Canvas, the learning management system, for grading. I encouraged them to read the blog post rubric to ensure that they wrote postings that answered the questions I had proposed in the assignment. 20 – Video is still and not grainy. Angle is appropriate for the event. 20 – Audio quality is exceptional and clear. 10 – Student team used Periscope, set up an account and wrote a “headline” for the broadcast. 12 – Video is a little shaky. The usage of a tripod or another bracing device would have helped it. The angle could have been improved by moving to a better location. 12 – Audio quality is a little muffled. Simply moving to a better position before the “broadcast” would have helped. 8 – Student team used Periscope, set up an account but did not write a “headline” for the broadcast. 6 – Video is extremely shaky or grainy. Student team may have tried to zoom in with the iPad rather than changing positions. 6 – The audio is muffled and unaudible. 0 – Student team did not set up an account and didn’t use Periscope. Students will write the blog post in the course blog and submit through the learning management system. 20 – Student provides well-thought out answers to the questions posed in the assignment. 20 – Student’s writing is clear, concise and free of any Associated Press or grammatical errors. The writing style engages the reader and makes the reader want to read the post. A headline is used for the blog post and for the Periscope. 10 – Student embedded a video of the Periscope through their YouTube channel or uploaded it directly to the course blog. Links were used to reference the articles assigned as readings. Or links were used to reference other articles and information about Periscope and its use in newsrooms. 15 – The post answers most of the questions posed in the prompt. The student answers the questions but does not provide rationale or additional context for his or her answer. 15 – Student’s writing is mostly clear. Editing would help improve it. A few minor grammatical or style mistakes that editing could fix. 8 – Links were used, but the links may be broken or take the user to the wrong place. A video is attempted but did not upload. 8 – The post answers only a few of the questions posed. The student does not provide any additional rationale or context. 8 – Student’s writing is confusing, and editing would require massive corrections. An editor would ask for a complete overhaul. Multiple Associated Press style and grammatical mistakes. 3 – No video used. One link used. Overall, the students expressed that they enjoyed the experiment, but they wished they had found an audience. As we were using a new app to cover an event in a rural area, finding an audience proved more challenging than either the students or I imagined. The speaker only appealed to journalism students, and his topic of business journalism didn’t draw the pool we expected from the business college. For future assignments, I plan to find an event that has a larger draw, such as a university-wide campus-life event or a citywide political event. Most of the students wrote in their blog posts that the video streaming apps may be useful for breaking news situations or large-scale events with good visuals. The appeal comes from the fact that online journalists can use an iPad or smartphone to capture and immediately broadcast events rather than hauling around heavy camera gear. Additionally, they said the ease of shooting could be useful in situations where it might be difficult to get lighting and equipment set up such as protests or mass shooting sites. I found the exercise successful because students incorporated the idea of immediacy for breaking news, and they embraced a new technological tool. Although technology certainly will change throughout their careers, their demonstration of deploying a new form of media will translate into adaptability later in their careers. Our experiment used the iPad so students had to think about how to frame their video and the angle they took (full face, close up, angled, etc.). Periscope now allows for both horizontal and vertical video. iPad shots can be unsteady if they are not mounted on a tripod. Students have to determine which shooting method works best for them (a tripod or some type of other mount or using their arms). A tripod or other mount should be used to reduce the shakiness of the iPad, and if students use mobile devices such as iPhones or iPads for streaming media, the shot needs to appear as professional as possible within the limitations of the technology. We will need to adjust for audio in the future. The department needs to buy microphones for the iPads so that the audio quality will become more professional. Students who sat near the front of the room had better audio quality than those who chose to mount their iPads on the backs of chairs in the back row. We need to tell students to be mindful of the wi-fi capabilities of the venue. We experienced trouble with an overloaded wi-fi network in the student center dropping out. If a student chooses to use his or her smartphone, alert him or her to the chance that if wi-fi drops out that he or she will have to use a data plan. For students who do not have an unlimited plan, this could become an issue. Additionally, live-streaming apps drain the battery life of a device. We will need to remind students to log out of their Twitter and Periscope accounts on the class iPads so that another class does not use their accounts. The addition of these apps to the curriculum offers a chance for in-depth exploration of the mobile disruption to media and society. Since the apps had recently emerged at the time of the assignment, I gradually came to understand the legal and ethical concerns. Since this first experiment, I have refined the unit to include discussions of legal and ethical ramifications of going “live” from a scene. For instance, a podcast from the Student Press Law Center helps students to better understand some of the legal challenges. Although I could ask students to read a scholarly article about the challenges in Journalism and Mass Communication Quarterly by Chip Stewart and Jeremy Littou, the podcast is more accessible for today’s busy student. Stewart and Littou raised the issues of privacy and the right to photograph and capture video in public in their article, and both of these issues would be ripe for discussion among college students who are constantly photographing and videotaping their lives as well as that of their friends and pushing it out onto social media. The unit is now more discussion-intensive with students thinking about how they would respond in breaking news situations when confronted with legal or ethical issues, including privacy as referenced from the JMCQ reading. I have also asked students to consider how much interaction (if any) that they believe a reporter should have with a live-stream audience during news reporting. Additionally, I have asked students to monitor how news outlets use live-streaming apps for behind-the-scenes promos or coverage such as severe storms/tornados. I’ve also asked them to analyze tweets that promote the Periscope streams. Since live-streaming apps do not appear to be fading as the latest shiny gadget in the toolbox, student journalists and instructors must continue to experiment and find ways to bring this technology into the classroom and the newsroom. As the media environment continues to change, students and instructors must embrace and adapt to new ways of communicating with an increasing audience on social media. Leigh Landini Wright is an Assistant Professor of Journalism and Mass Communications at Murray State University. Prior to teaching, Wright worked as a journalist for nearly twenty years. Her research interests include best practices of social media for community journalism, social media pedagogy, and interactive learning techniques.